LOS ANGELES (Reuters) - A fierce wildfire that has forced the closure of an interstate highway in Northern California raged for a third day on Friday through explosively dry mountain timber in the Shasta-Trinity National Forest, as crews battled to outflank the flames. The Delta Fire has scorched nearly 25,000 acres (10,000 hectares) in the Cascade range since erupting on Wednesday in a forest canyon along the Sacramento River, about 250 miles (402 km) north of San Francisco, fire officials said. Containment of the blaze, a measure of the progress made by firefighters in carving buffer lines around the fire's perimeter to halt its spread, remained at zero. But crews have made gains clearing away beds of tinder-dry brush beyond the fire's leading edge, reducing the amount of fuel available for flying embers to easily ignite and thus stunting the fire's growth. The underbrush is being removed with a combination of bulldozers and hand tools, as well as controlled burning operations, said Captain Brandon Vaccaro, a spokesman for the Delta fire incident command. "We're actually getting a lot of work done and making a lot of good progress, but that progress is not at the edge of the fire," Vaccaro told Reuters by telephone. "We're removing the fuel from in front of the fire." 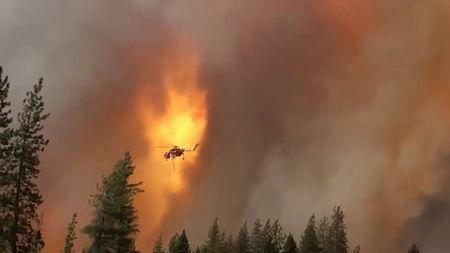 Vaccaro said about 300 people were under mandatory evacuation orders in Shasta and Trinity counties. Farther north, an evacuation warning was in effect for the town of Dunsmuir, advising some 1,600 residents to be ready to flee at a moment's notice. The blaze also has caused major travel disruptions in the region. On Wednesday, flames raced across Interstate 5, chasing a number of truckers from their vehicles before flames engulfed their abandoned rigs, though no serious injuries were reported. The fire has spread quickly through the drought-stricken pine forests thick with dead and dying timber ravaged by bark beetle infestations. Shasta County communities near the fire zone are still recovering from a devastating blaze earlier this summer that killed eight people and incinerated hundreds of dwellings in and around the town of Redding. California's wildfire threat could intensify again next week with forecasts calling for a statewide heat-wave in the days ahead.